Do you have a WHS policy? Yes, we do. Please see our WHS page under ‘About Us’ for more information. 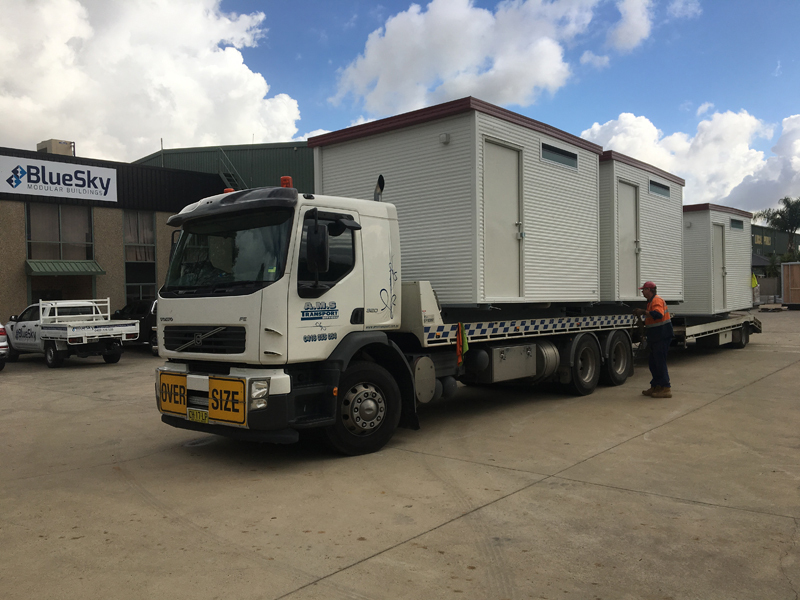 While your modular building is being built by our tradesman inside our factory, our installation team will be on your site preparing for the delivery of your modular building. Any services that need installing including piers and footings will be done at the same time as your building is being built. You can see how much quicker your home, office or classroom will progress when you choose BlueSky Modular Buildings. Within 1-2 weeks, we can have your building installed and ready for occupation. BlueSky does not need the traditional 6-8 month build time but rather 8 -15 weeks (pending project size) saving you time and money. What types of buildings can be made modular? Modular buildings have come a long way. Now, they offer some of the most comfortable, modern, and energy efficient buildings for offices, schools, mine sites, portable site offices and more. Why are they so good? Because modular buildings are made from the highest quality materials using modern construction techniques. BlueSky Modular provides the options for either Gyprock Plasterboard or RV Lite Grey Embossed (Polyester) wall coverings. Embossed Plywood is overlaid with attractive polyester coating for greater wearability. The traditionally applications include Internal wall panelling and ceiling linings. The ply is available in a variety of coloured finishes. Gyprock Plasterboard is an internal wall and ceiling lining used in residential and commercial lightweight framed construction. Special sheets are available for applications requiring acoustic insulation, impact resistance, or moisture and mould resistance. The steel beams used are lighter than wood. Steel frames can be rapidly engineered in our purpose built factory, faster and more precisely than wood. Steel requires little maintenance or repairs. Steel is resistant to pests and wood rot. Can be engineered for large, clear span areas. Can be paired with wood to maximise the strength, durability and support benefits of steel, together with the insulation properties of wood. The connections are so exact that an almost air tight seal is possible with the addition of insulation. The strength of modular buildings is further enhanced with Colorbond Steel wall cladding on the outer walls. These sheets have a thin, attractive profile that is ideal for wall cladding. Available in 22 standard colours, and 5 matt colours to suit any project. Steel wall cladding is also easy to maintain, long lasting, lightweight. It is suitable the extremes of the Australian climate, and resists chipping, flaking and blistering. To find out more, contact our team of modular building experts.